There are any distinctions to differentiate between bamboo and rattan or wicker rattan, relating the roots of origin and the used. Bamboo: Bamboo has strength, flexibility and versatility. The culms have been used mainly in housing and for other construction purposes for centuries, particularly in rural areas. Other uses of bamboo are many and varied. It is used in the making of furniture, handicrafts, basketware, matting, rayon and paper, and it is used as food, fodder and fuelwood. In India, for example, much of the pulp used in making paper is from bamboo, just as it is in China. In Japan, Taiwan, China and Thailand, shoots of many species are valuable as food. Relatively few species of bamboo are, however, currently used on a commercial scale. Rattan: The bare stem of climbing rattans has its strength, flexibility and uniformity. It is used in the construction of cane furniture and matting of the commercial trade. Because of poor mechanical properties, relatively few species are currently used on a commercial scale. In rural areas, a larger proportion of rattan species has been used for centuries for numerous purposes such as cordage, construction, basketry, thatching, matting and the like. Rattan is a solid timber vine that is very flexible, can be woven into wicker. 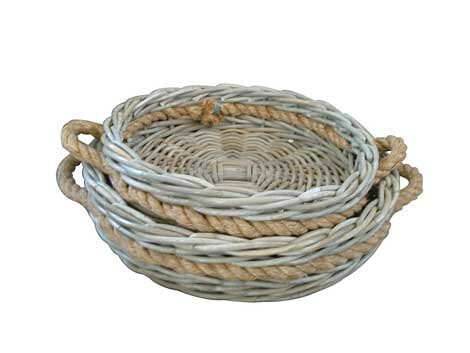 Wicker rattan is a woven product made from rattan cane. Rattan cane comes mainly from the tropical rain forests of Indonesia, and from some plantations, but it is not widely cultivated. As a commercial product, rattan is mostly limited to use in the furniture and home accessories industry, although in rural areas it is widely used to make baskets, mats and thatched roofs. Both bamboo and wicker rattan are classified as sustainable products due to their fast-growing properties. Bamboo is a woody tropical grass with hollow stems. Bamboo can grow in many different climates and is widely farmed commercially. Bamboo is used to make flooring, furniture, handcrafted items, baskets, clothing and paper, and it is also used for food and fuel. Bamboo cannot be bent, therefore it is never woven.